Republished from Black Rose Anarchist Federation. Following up on our article “One Million Hands Flourishing: Nicaragua and the Neverending Task of Planting” by US based Nicaraguan anarchist Tanya H.F. we present an interview with an Miranda, a Nicaraguan based anarchist who is deeply involved in the student protest and university occupations. This was based on a podcast interview on Hotwire # 28 released on April 25, 2018. Hello friends, this is Miranda. I am part of a group of delegates that are doing international media outreach here in Managua, Nicaragua. I am also part of several other affinity groups that have been working nonstop for the last two weeks because Nicaragua is recently experiencing an unprecedented wave of nationwide protest. At the beginning people were protesting because of how the government mismanaged an environmental crisis. It took them ten days to effectively shut down a fire that was happening on top of a natural reserve in indigenous community. And the fire happened because the government has allowed, and has interest, in cattle ranchers expanding their territory into indigenous communities. Also, the government has interest in the monocrops of, for example, palm oil, in indigenous communities and the Caribbean. That is what started the environmentalist movement and protests. In the middle of that the government did a reform to the social security institute which basically recognized that the social security institute was going bankrupt and needed to take more money out of all the people that were receiving pensions from there. Basically the social security institute has been used as a piggy bank for the government’s private investments. But those investments haven’t gone so well, so now they want to reform how everything works so they can get away with their failed adventure. But then, those two movements got together and started protesting together, it basically led to a protest, which was quickly and violently displaced by the police, by anti-riot police, by Sandinista Youth, and by motorcycle gangs that have ties to the police and the Sandinista Youth. The image that sparked all of this was anti-riot and Sandinista Youth attacking peaceful protesters that were protesting against the changes in the reform of these social security institute. That happened on Wednesday [April 18] and on Thursday [April 19] three major universities were protesting the same thing but specifically added [to their demands issues of] police repression and lack of free speech in this country. All day Thursday we had very violent confrontations between students and riot police and Sandinista Youth. By Friday [April 20], the government still hasn’t made any official communiqué and the protests continued, but then expanded to other cities all over Nicaragua. All protesting at this point, not so much about the reform or the environmental damage that happened, but now against authoritarianism, against all the bad things that the government has done since they came in power in 2006, specifically against police brutality and against the fact that a lot of students were being murdered by the police. [As of] right now we have calculated that over 30 people have been murdered. Over 100 people have been detained. And over 40 people are still missing, stemming from Thursday. And all of this is the responsibility of the government. But then the government made a public speech claiming that this movement was a right-wing conspiracy theory funded by the CIA basically, which is completely false, specifically because the student movements have made it clear that they don’t want any political parties co-opting the student movements. The student movements have made it clear that they are denouncing the private sector because they recognize that the private sector has their own interest in negotiating with the state. The self-assembled movement, which is what came out of the environmentalist and the anti-[social security] reform movement, have also denounced the complicity of the private sector and have basically been very vigilant of not just the private sector but of upper class and other right-wing movements from co-opting this entire movement since everybody wants a piece of the pie. In terms of the anarchist influence in all of this, its very complicated. Because Nicaragua doesn’t necessarily have a big anarchist tradition. Our national hero, Sandino, did become radicalized in Mexico in the 1910s and 1920s, he did adopt the red and black flag from Spain [Spanish Anarchists], and he did basically work in cooperatives and learned about class struggle and had very much anarchist leanings, but right now I think that the state is still—there’s a very harsh critique of the state, but the state is still seen as a solution. Right now, the biggest anarchist presence has been this non-hierarchical, horizontal organization by which the students are organizing in, and by how these affinity groups are organizing in. People aren’t claiming to be anarchists but they’re practicing all these anarchist tactics and anarchist philosophy of power, of representation, of anti-state, of solidarity, of mutual aid, of affinity groups. A clear example of an anarchist tactic has been this idea of the occupation of a university ground. We have several reports of friends who have gone inside the university, the polytechnic university, and have said that its like an anarchist utopia inside—where there’s delegates for medics, for cleanup, for security, for fabricating [Molotov cocktails], for absolutely everything inside of the occupied university, which is at this moment the biggest stronghold against the police. But it’s also the place that has received the most violence and repression from anti-riot police. But it’s important to recognize that in the march that happened today, there were hundreds and probably tens of thousands of people gathered and the only thing that they have in common is that they don’t like the government. But inside of that movement, there are very different and even contradicting ideas, because in one march you will see the private sector marching next to the feminists marching next to the environmentalists marching next to the self-assembled movements. But right now, people aren’t protesting against the reform of the social security institute, which the government actually revoked and they said that they’re going to start from scratch – which is a partial victory – but at this moment it’s no longer about social security. It’s about the fact that the government has allowed for thirty people to die and hasn’t commented about it. Today, the US embassy sent a communiqué saying that families of the workers inside the embassy had to leave the country. Also they said that the Peace Corps had to leave the country. So that’s the level of uncertainty that the United States intelligence is saying [something] might happen, and it does give you a sense of the intensity and resonance of these student movements that have been happening here. To be honest, things seem like they’re winding down, but they could easily wind back up at any second. It only took a matter of hours for the entire nation to see police brutality attacking peaceful demonstrators and students to get everybody enraged against the government. 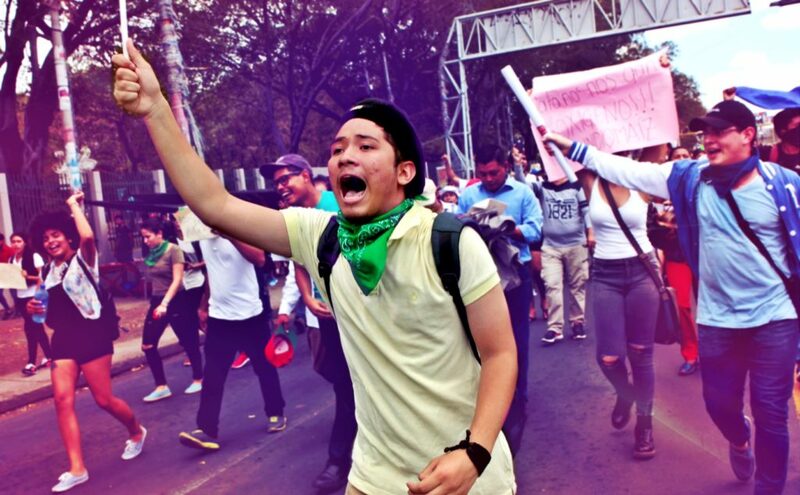 Cutting Class Editor’s Note: Donate to Nicaraguan organizers to help support the students in their work.